The “Year of..” calendar is a annual means of winter income for me through O’k CSAe (see membership attachment below), which helps support my work with Little Artshram’s Art-Farm and Community Gardens. This year, through calendar sales, I’m also helping support two Permaculture Design Course and Teacher Training scholarship funds that have contributed greatly to my life and well-being. In creating this hand-made calendar, I take a few liberties with the traditional Chinese New Year method of designating each year to a specific creature. SInce I live and work in Northern Michigan, I’ve decided that the creature must be of a mid-western regional variety. Since there are no nearby tigers to observe and sketch, I’ve named this the Year of Cat and given my cat, Roslina Falling Star, a starring role. This is a unique calendar that runs from February 2010 to February 2011, connecting it to the beginning of Chinese New Year, and the mid-point between Winter Solstice and Spring Equinox. 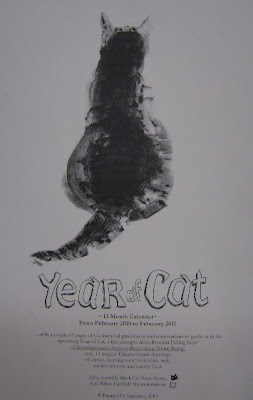 The calendar contains a couple of pages of Cat-inspired predictions, a few excerpts from Rosa’s 12 Interdependent Steps to Recovering (Your) Being, 13 original, Chinese brush ink drawings of clever, cunning communicators,and sometimes cute and cuddly cats. If you would like to join O’k CSAe and receive an “art-share” each month (through May 2010), likewise email me at the address above and I’ll forward membership information. Penny Krebiehl, also known as O’k, is a certified Permaculture designer and instructor, as well as an artist and community organizer specializing in programming for children, youth and their families. She conducts many creative, educational events, helps build the Grand Traverse Earth Day Parade and offers Permaculture design services and consultation in Michigan. Penny has studied, trained, and practiced with Permaculturists in North West and North Eastern United States since 2005, and gives grateful thanks to all of her devoted teachers. She is the founder and Executive Directress of Little Artshram, a non-profit, begun in Lansing, MI in 1993 and is inspired by children of all ages who are close to the earth, learning and re-learning as we mimic nature both in our educational systems as well as within the great paradigm shift and transition of our social, cultural structure. Penny believes that art and education are an important component of the community food system, and began O’k CSAe (Community Supported Articulture & Education) in 2008, selling art-farm shares to support her non-profit devotion to Little Artshram. Permaculture principals, ethics and the Eco-Design process have been a central part of the development of the Little Artshram Art-Farm and Community Garden programs, located at the old State Hospital on the Historic Barns property, in Traverse City, MI, as well as O’k CSAe.